Whey protein is a mixture of proteins found in whey, the watery part of the milk remaining after it has been curdled and strained. Whey protein powder is good for you because it is rich in essential amino acids that promote good health and help your body to function properly. Among the benefits of whey protein are helping you to lose weight and body fat, build muscle mass, reduce your risk of cardiovascular disease, and manage diabetes symptoms. Whey protein comes in 3 different types – whey protein concentrate, whey protein isolate, and whey protein hydrolysate. These types of whey protein are good for your health because they can help to improve the nutritional content of your diet. It is also very easy to add whey protein to your diet. Most people add 1 or 2 tablespoons of whey protein powder to make a whey protein shake. In this article, you will learn about the benefits to your health and weight management that whey protein powder can give you. Whey and casein are the main two proteins in milk. Casein makes up about 80% of the milk and the rest is whey. Whey is the liquid substance left over during the cheese-making process, when casein turns into curds. Whey protein powder is made by processing the liquid whey into dry powder. Whey protein is considered to be a complete protein source because it contains all the 9 essential amino acids. Whey protein powder doesn’t taste good on its own. Most people who use whey protein powder to increase their protein intake buy flavored whey protein. Some of the most popular flavors of whey protein powder are chocolate, vanilla, and strawberry. To mask the unpleasant taste of whey protein, you can also add a tablespoon of it to your favorite smoothie. Whey protein powder is also added to shakes, meal replacements and protein bars. There are 3 main types of whey protein that you can buy. Whey protein concentration is the least processed of the three main types of whey protein. Whey protein isolate contains about 90% protein and is the purest type of whey supplement you can buy. Whey protein hydrolysates are whey products that have been processed to break down some of the protein structures in the whey. Which is the Best Type of Whey Protein? You can easily use whey protein powder to boost the nutritional value of your food and get many health benefits. But which type of whey protein should you choose? Most people choose whey protein concentrate because it is the cheapest form of whey protein and contains high-quality protein. Whey concentrate supplements come in many flavors and can help make delicious protein-rich smoothies. If you find that whey protein concentrates affect your digestion and cause cramping, whey protein hydrolysate may be the better option. Whey hydrolysates are so easy to digest that they can be given to infants to help improve the nutritional value of their food. Whey protein isolates contain very little lactose and are a good choice if you have sensitivities to lactose and you need high-protein shakes. Let’s look at the many reasons why whey protein is good for your health. One of the main reasons why many people consume whey protein shakes is to boost their protein intake. Learn about other high-quality sources of meat-free protein that are suitable for vegans and vegetarians. One of the health benefits of whey protein powder is helping to prevent loss of muscle mass without any side effects. There are many reasons why people choose to take protein shakes to build muscle mass. Whey protein helps build muscle when taken after weight training. Whey protein shakes can also help prevent muscle waste in the elderly. Learn about effective ways to help get rid of muscle soreness after exercising without using anti-inflammatories. Taking whey protein powder can help you lose weight because it helps to increase feelings of satiety. If you suffer from belly fat, you can find how to lose stubborn belly fat for good without counting calories in my ultimate e-book guide Blast Your Belly Fat. Another reason why whey protein powder is good for you is that it helps to protect the health of your heart. Find out how to keep your heart healthy and reduce your blood pressure without resorting to medication. Having a whey protein shake every day can also help to provide your body with antioxidants that boost your immunity. If you frequently suffer from infections, you should try some of these 10 hacks to boost your immunity almost instantly. You can also strengthen your immune system with these herbs and supplements. Taking whey protein powder that is packed with amino acids can help to lower inflammatory responses in your body. Although short-term inflammation helps to get rid of infection, chronic inflammation has been linked to diseases such as heart disease, cancer, and diabetes. Along with taking whey supplements, do you know what other foods help reduce inflammation? Knowing what to eat and what not to eat if you have arthritis can help to quickly improve your quality of life. The presence of essential amino acids in whey protein powder can help to relieve symptoms associated with Crohn’s disease and ulcerative colitis. Greasy stool that is the result of inflammatory bowel disorder is just one of the signs that your digestive system doesn’t work properly. Amino acids in whey protein powder also seem to help in controlling some of the symptoms of type 2 diabetes. Find out how to prepare okra to help treat type 2 diabetes and manage its symptoms, or consume these foods to control type 2 diabetes. One of the beneficial effects that regularly taking whey protein powder in a beverage can have is lowering levels of cholesterol. Learn about other ways of lowering your cholesterol naturally and what foods you should eat to prevent clogged arteries. The recommended daily allowance of whey protein powder is 1–2 scoops (around 25–50 grams) usually after workouts. But it’s also recommended to read the serving instructions on the packaging of your supplement. If you’ve ever noticed a clear, sometimes slightly milky layer on top of your yogurt, then you have already made your own whey! Although protein shakes are really convenient, you can opt to make your own whey by separating the whey from products like natural yogurt or kefir. All you need to produce your own whey is some cheese cloth, a strainer and naturally fermented milk products. As an example you can make whey from good quality (and preferably organic) yogurt. Set a large strainer over a bowl with a clean cheese cloth. Pour in the yogurt. Cover and let stand at room temperature for several hours, until the yogurt is thick like Greek yogurt. The whey will run into the bowl and the milk solids will stay in the strainer. The most common ways to consume whey protein powder is in a liquid form. Most people put it in a shaker cup, add water, shake, and you have a portable drink to revitalize your muscles and energy. Some people put it in a blender with milk, fruits, greens and nut butter. 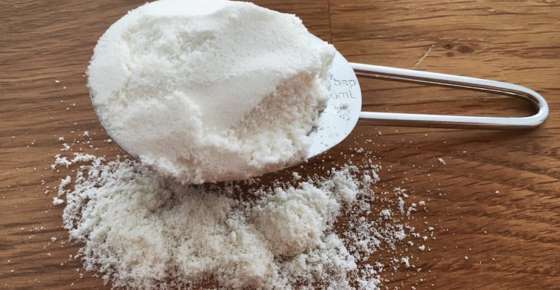 But whey powder isn’t only for liquids – you can add whey protein to many homemade bakes and other dishes with countless recipes available for making your own, protein rich, delicious food. You can add it to a variety of dishes, such as muffins and cupcakes, burgers and lasagna, dips, doughnuts and more! You can buy a whey protein powder at your local health store, online or at your supermarket, but try to opt for a raw organic whey protein from the milk of grass-fed cows like this USDA certified organic whey. Why not just consume the yoghurt or the kefir, then, on a daily basis? Much easier. Why separate it. Why not blend the yoghurt or kefir straight into the smoothies, bake-offs or dishes? Both yogurt and whey provide protein. Which type you choose depends on your personal preference, your goals, your caloric needs, convenience, cost etc. For example: Whey powders offer a concentrated form of milk protein, which has more protein than a cup of yogurt, or some people use it for building muscle after weight training. Also some people are lactose intolerant or don’t like the taste of kefir, so whey protein isolate can offer them a good solution. Not a fan of whey protein. It can lead to inflammation of the gut and also excessive mucus production neither of which I’m a fan of. Although I’m not vegetarian, I would look at almost any plant source of protein instead.